Sandra is a Registered Veterinary Nurse who has come to work with Eastbourne Vets in October 2017. 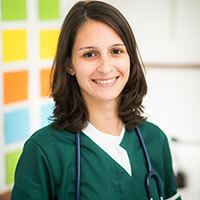 Sandra graduated in 2016 having completed her studies in Escola Superior Agraria de Viseu, Portugal. Sandra loves nursing and has a particular interest in physiotherapy and in-patient care. She owns 5 cats and 2 dogs.